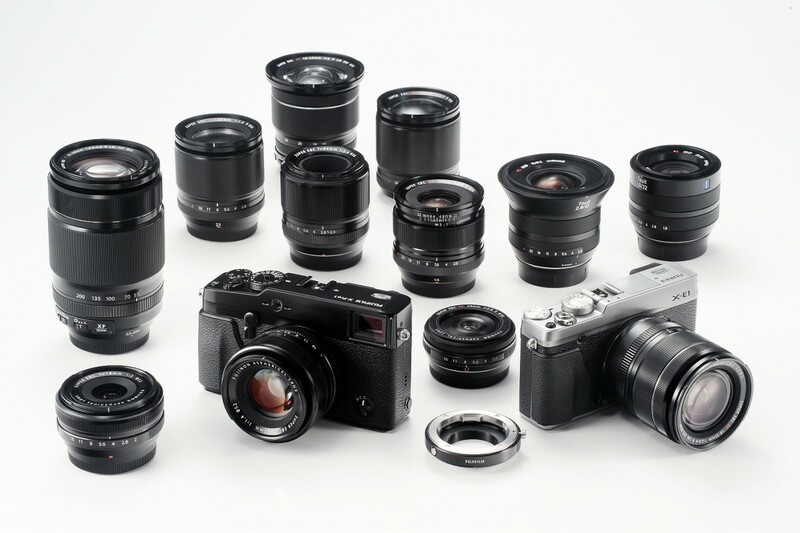 Will Fuji match MFT comprehensive lens range in 2014? I have been very happy with Micro Four Thirds, especially with the extensive range and quality of lenses available to the system. The other mirrorless systems like Fuji X mount, Sony E and FE mount, or Nikon 1 had not come close on the lens range. But Fuji is working very hard lately to change that. They are putting out quality lenses on a rapid pace, and with good strategy. In tandem with my continued admiration for the Fuji look, better ISO noise control, and JPG quality, this had me sat down yesterday and assess how Fuji lens range is panning out. This assessment is to satisfy my own curiousity, so I am approaching this questions based on how I might be able to replace my current MFT lenses with somewhat equivalent X lenses. While this comprehensive list shows more than 50 lenses for MFT, the ones that matter most to me are these following 3 primes and 2 zooms, starting with.. Some like 28mm, some like 50mm. I like 35mm (full-fram equivalent) focal length the most for walking around. The XF 23mm is highly praised by those who have used it. It is well liked for low light use, with fast autofocus, optical quality and sturdy build, and form an impressive array of quality primes for Fuji system together with the XF 14/2.8 and 35/1.4. But, my prior concern that high quality Fuji X lenses are larger, heavier (301g vs 120g), and more expensive ($799 vs $499) seems to hold true for this focal length. Of course, the XF 23 is a full stop faster, which typically comes with higher size and weight, but the Leica DG Summilux 25mm f/1.4 only weight 200g, so there’s that. For capturing my 3-year-old, the M.Zuiko 45mm f/1.8 is my current lens of choice. It provides enough distance to subject such that she is more relaxed and in her element. She is growing up quickly, and has become more consious with a camera in front of her. And the 28mm and 50mm (35mm full-frame equivalent) focal length that I used to prefer now fall out of favor for this reason. While the M.Zuiko 45 is positively tiny and offers the best bang for the bucks for any mirrorless systems, the Nocticron is actually the heaviest and by far most expensive of the lot. Both the Nocticron and XF 56 are fairly new, and there are not that many comparative reviews available. But from early looks, they seem to be a close match. So, for top-of-the-line, short-tele portrait lenses, Fuji X actually offers the more affordable option. If you want a tiny package, though. Fuji still has no answer to the M.Zuiko 45. The XF 60/2.4 should not be far off optically, but it is about twice as heavy. The M.Zuiko 75mm f/1.8 is a unique lens. Some swear by it for portrature. Some loves it for concerts & plays. Yet others like it for picking out fine details in landscape or architecture. Many find the 150mm equivalent focal length unfamiliar, but those who love it usually say it is magical. I am in that latter group. Currently, the X mount line does not have anything similar or on the roadmap. This is more for Olympus’s credit than a criticism for Fuji. While the 135mm equivalent focal length is liked by some for portraiture, 85mm is more common. Yet Olympus decided to come out with this smashing lenses and it blow everything on MFT away in terms of sharpness. This, except perhaps the new Nocticron. Will a lack of an equivalent lens in the Fuji camp stop me from seriously considering a switch? Probably not. However much I love it, it is still not as essential as my other lenses, including the next two. I have been a prime shooter for most of my time with Micro Four Thirds. I had bought some relatively good zooms, such as the Lumix G Vario 45-150 , the M.Zuiko 9-18mm, and the new Lumix G Vario 14-140 f/3.5-5.6. They provided good range and versatilty. But in the end I sold them all because I am spoilt for quality by the prime lenses. When I read reviews of Olympus’s first PRO lens for Micro Four Third, the M.Zuiko 12-40mm PRO, it made me wonder if this really packs the quality that can satisfy my crave for sharpness. Then my brother got one and sold every prime he had in the covered range except the Voigtlander Nokton 17.5mm f/0.95. So on that fateful day I shelled out $880 for a de-kitted 12-40mm, even though I was not sure I can live with a lens that heavy on MFT. Up until then, the Lumix 14-140 II was the heaviest lens I had at 265g. I don’t always enjoy carrying the 12-40 (382g!) with my GX7. But when I do, I gives me the peace of mind that if I were to miss some shots, it will not be because of the lens that is mounted on my camera. It is extremely sharp, focus fast and very close, and a joy to use. I sure hope Fuji has an answer to this. P.S. Of course, I know Olympus did not invented the constant-aperture normal zoom. But in J’s words, they made it look good. There is nothing much that can be said about the XF 16-55/2.8, except that it should come out later this year. Well, nothing about the opical performance, anyway. From pictures of the lens, we can expect it to be HUGE. Scroll to the bottom of this page, and you can see a side by side comparison of 5 lenses. The XF 56/1.2 (left most)which I said above was very big and heavy (405g) looks like a dwarf compared to the XF 16-55/2.8 (second from right) The XF 16-55/2.8 looks to be around 10cm in length, and I will not be surprised if it weights 600g or more. Look how it tapers out from the lens mount to the barrel. With training from the M.Zuiko 12-40/2.8 and 75/1.8, my weight tolerance has somewhat increased. Enough that I picked up the Lumix 35-100mm f/2.8. It was my latest lens purchase, and I was very happy to pick it up used for $865. Similar to the XF 16-55/2.8, the XF 50-140/2.8 is slated for release toward the end of this year. And in the sam vain, it is going to be quite a bit larger and heavier than its Micro Four Thirds counterpart. The 50-140 looks roughly 2.5 times the length of the 56/1.2, or about 17-18 cm in length. That makes it about the same size as the Nikon AF-S 70-200mm f/4! It is still smaller than the Nikon AF-S 70-200mm f/2.8, but not by a wide margin. That’s nothing compared to the dimunitive Lumix 35-100/2.8, which is 9.9cm in length, and does not extend on zooming. I can’t see myself ever using something the size of the XF 50-150/2.8 on a body like Fuji X-E2. The above comparisons are my way of rationalizing. Putting thoughts into writing makes them clearer and more organized. And having finished the exercise, my conclusion is clear. I will be willing to trade my 3 MFT primes for the 2 Fuji primes. But I will be reluctant to trade my f/2.8 MFT zooms for the larger Fuji counterparts. I went the whole of last weekend with GX7, Olympus 12-40/2.8, Lumix 35-100/2.8 and Olympus 17/1.8, which together weight less than 1,300 gram, all packed in a shoulder sling bag. The equivalent f/2.8 zooms for Fuji are not out yet, but if they are I estimate that an equivalent kit with X-E2 body will weight about 2,100 gram and likely need a considerably larger bag. With the upcoming lenses in Olympus PRO range are also pushing boundaries further, with the 40-150/2.8, 7-14/2.8, and 300/4 all offering something never before available to Micro Four Thirds system and extending the advantages further. Fuji has done a tremendous job closing the gap, but MFT is not staying still. (I do hope to see more from Panasonic, though) It is good to be a photographer at this time, with so many good options to choose from for differing needs that each of us have. As for my desire for Fuji file quality. I might have to quench that thirst with an X100S, or better, a smaller cousin that retains the APS-C X-Trans sensor. This is a valuable type of lens for many, especially for travel or for when there is absolutely no chance of changing lenses. So, while I already sold mine, I think it is a good comparison to make. Not beyond useable, but you better have a good shoulder strap if you are going to carry this on all-day hike or bicycle tour. I had the M.Zuiko 9-18mm and sold it after the novelty wears off. Truth be told, I have not learn to properly use an ultra-wide angle lens. I know this to be true, and thus has been stopping myself from getting the excellent Lumix 7-14 f/4. An even wider lens is not going to make my photography better until I learn how to use one properly. But this is again quite an importan category for many, landscape is a good example. So, here is a comparison. On the ultra-wide side, the Fuji’s offering is very compelling! The XF 10-24/4.0 is a third heavier and goes for around the same price. But the biggest, most significant improvement over the Lumix 7-14 is that it takes filter. The larger sensor size benefits the Fuji, as it only needs to provide 10mm focal length to match the field of view of the Lumix at 7mm. At 7mm region, it is pretty much mandatory that the fron element will be heavily convex (bulbous). They have to come with non-detachable hood, and of course does not take filter on top. The XF 10-24/4.0 is also stabilized (not sure how useful this is on ultra-wide angle). I (actually) own a Fuji X100S, and I love it. I was very interested in Fuji Xt1, but there is not possibility for electronic shutter. That’s why I’m going to buy a GX7! I am very happy with using GX7 and X100S, although the GX7 always make me slightly frustrate with X100S autofocus because it is just much faster. And I agree it’s great to have silent shutter option on both of them!